Russian parliamentarians have hailed the death of the Chechen separatist leader Aslan Maskhadov as a crucial victory in the fight against terrorism. But spokesmen for the leader, killed in a raid on Tuesday, said the struggle against Russian rule would continue. It is unclear if the killing will boost Russia's grip in Chechnya, experts say. Moscow had blamed Maskhadov for being involved in a string of deadly attacks, including the Beslan school siege. Maskhadov had denied the claims. Maskhadov, who was elected president of Chechnya in 1997, was seen as the most moderate of Chechnya's rebel leaders, analysts say. 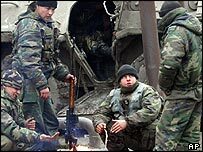 On Wednesday, radical Chechen leader Shamil Basayev - who claimed responsibility for the Beslan attack and also the theatre siege in Moscow in 2002 - vowed that the fight against Russia would go on. "Mujahideen [fighters] come and go. Those who fought for Maskhadov can rest," a statement attributed to Mr Basayev and posted on the Chechen rebel Kavkaz Center website said. "For those who fight for Allah, the jihad [holy war] continues," the statement said. Mr Basayev - alongside with another field commander Doku Umarov - are seen as possible candidates to succeed Maskhadov. 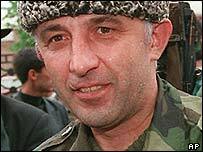 A Russian military commander in Chechnya formally identified Maskhadov's body on Wednesday, the Itar-Tass news agency reported. According to officials quoted by another Russian news agency, Interfax, the body would be buried in an unmarked grave rather than returned to relatives. Maskhadov was killed in a special operation by Russia's security services in the village of Tolstoy-Yurt near the regional capital, Grozny. Accounts differ on how he died: the Russian military claims he was killed by a grenade flung into his underground bunker after he refused to surrender but a Chechen politician said he had been shot dead accidentally by one of his own bodyguards. Vladimir Vasilyev, chairman of the security committee of the Russian parliament, or Duma, said the killing would put Chechen militants on the back foot. "It creates a situation whereby it is not terrorist acts they are thinking about, but survival," he said. Nataliya Narochnitskaya, from the Duma's committee of international affairs, told BBC News that the "terrorist strategy" in Chechnya had been "beheaded". She dismissed suggestions that Maskhadov was a moderate who could have partnered Russia in negotiations. "I don't know any case in the world history of terrorism that any political demands were ever the topic of negotiations with terrorists," she said. The EU has urged Russia to work towards a peaceful solution to the Chechen conflict while respecting human rights. An envoy for Maskhadov in London, Akhmed Zakayev, said earlier a successor would be chosen within days. Unlike Maskhadov, both Shamil Basayev and Doku Umarov have been opposed to talks with the Kremlin. The BBC's Sarah Rainsford says Moscow is celebrating a major coup but some others are urging caution. Maskhadov, she says, was widely seen as someone Moscow could negotiate peace with if it chose.